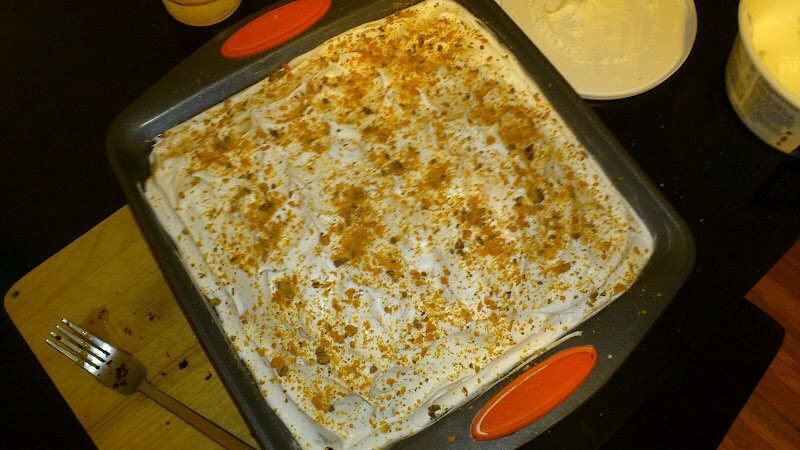 Anyways, we got to go to the “Makers Fair” in San Mateo, I will tell you all about it later this week because today I’m eager to share with you this DELICIOUS RECIPE “Butterfinger Cake” . How does that sound? We ate it I think in 4 days!!! SOOOOO YUMMY!! I just discovered it on another blog and believe me, when you make this cake you are going to ditch whatever your favorite recipe was and this will replace it …it’s such an easy cake to do. Here’s the link: BUTTERFINGER CAKE –> right out of my Ziplist recipe box! Here’s the picture of my cake ready to eat, it really looks very much like the one on the blog so I will say it’s easy for a newlywed girl, got my approval and my husband’s 🙂 … the other cakes I’ve done, taste good but they look horrible with any kind of decoration on top, this you can judge for yourself, here’s a pic. Hope you like it! Have a sweet week you guys! ← San Francisco most famous tour!